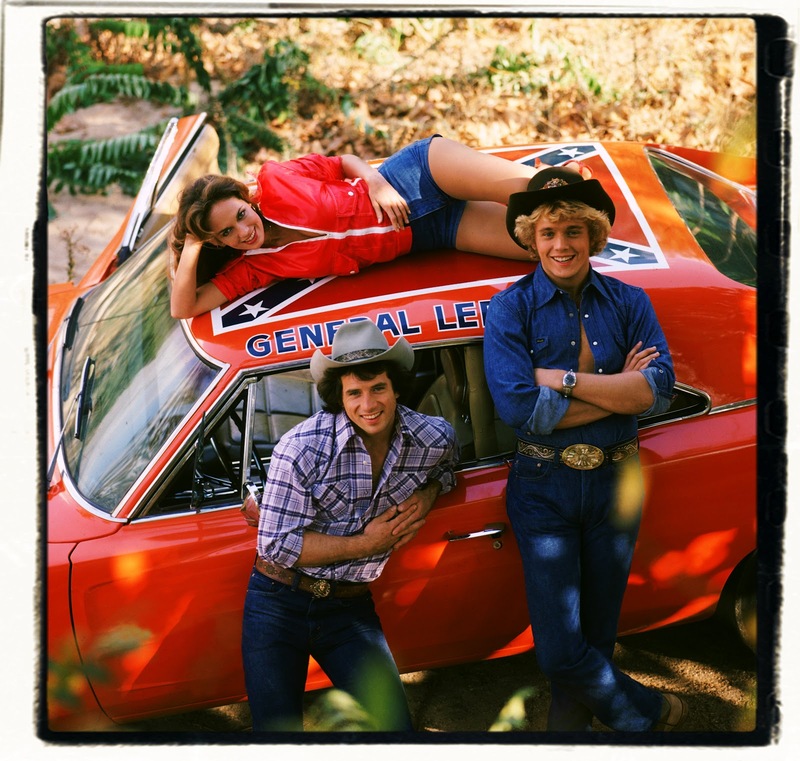 I’ll come back to the bit about The Dukes of Hazzard in a minute…(!) 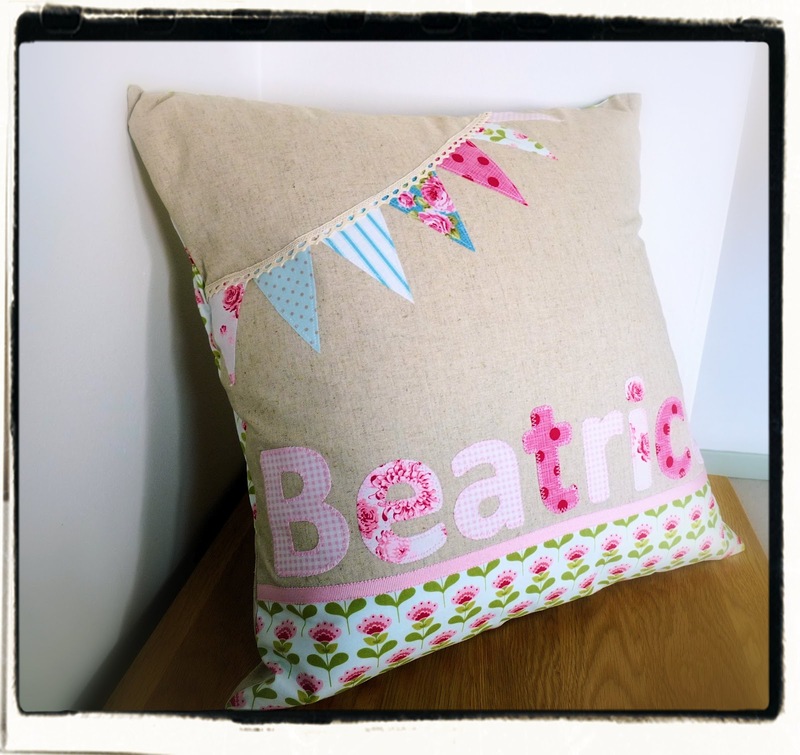 but for now I want to tell you about this cushion I’ve made for a little girl, Beatrice. 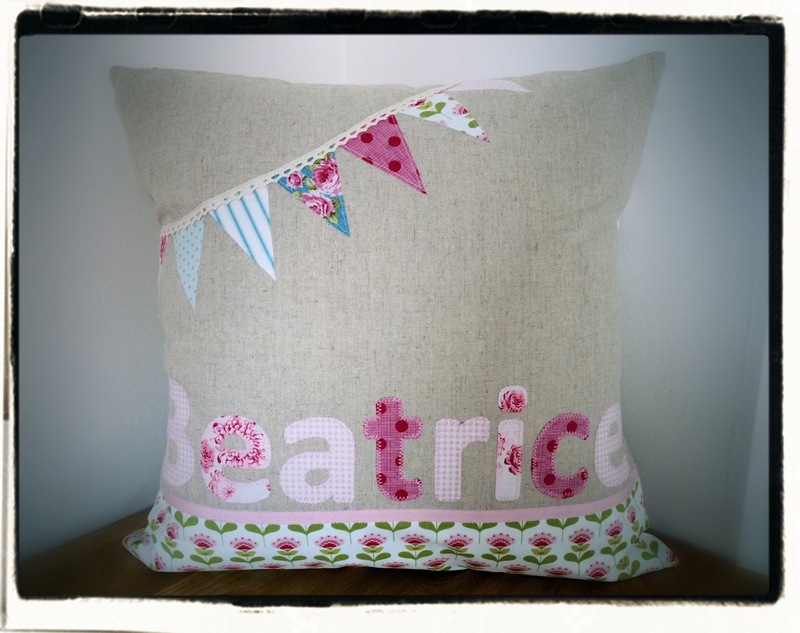 It is Beatrice’s Christening on Sunday and her Auntie is one of my oldest and bestest friends. 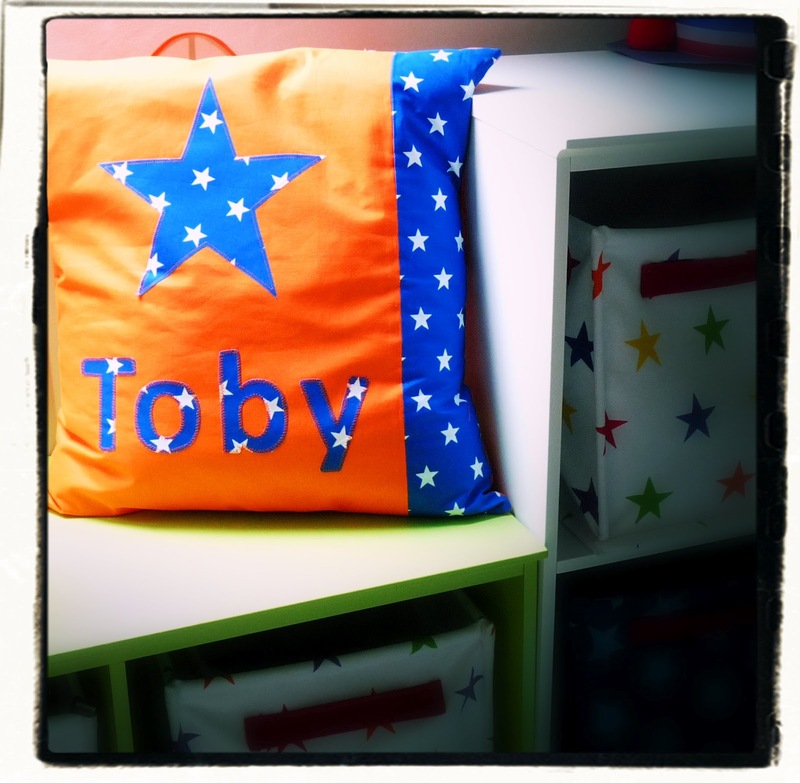 Said Auntie asked me to make a Christening gift…we agreed on a cushion and that it was to be personalised…. a few sketches later & I came up with this design. 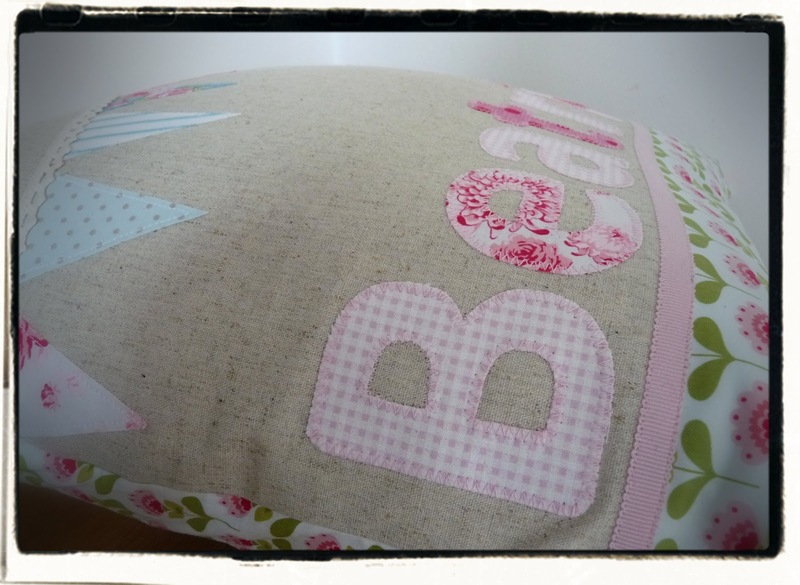 I didn’t want to make anything too ‘baby-ish’ as I think Christening presents should have a bit of longevity about them. 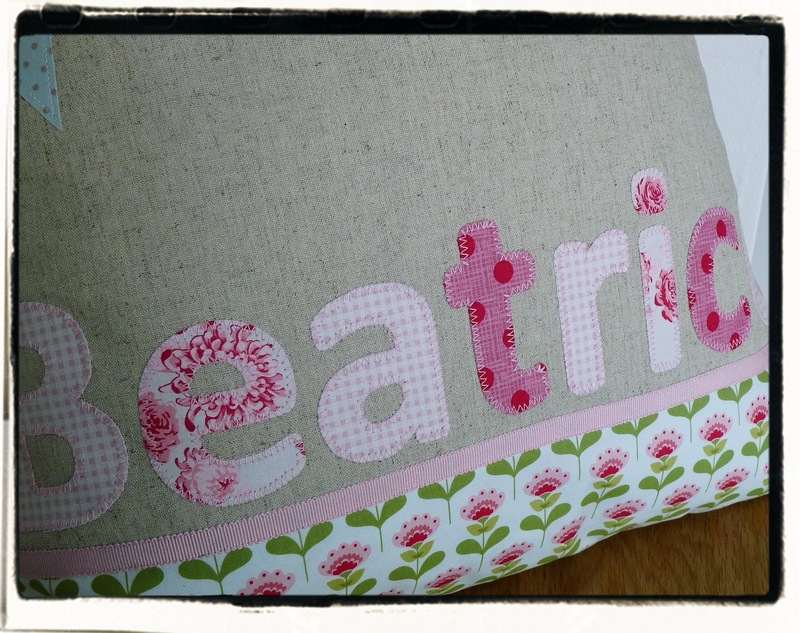 Hopefully this will grace Beatrice’s bedroom for many years to come. 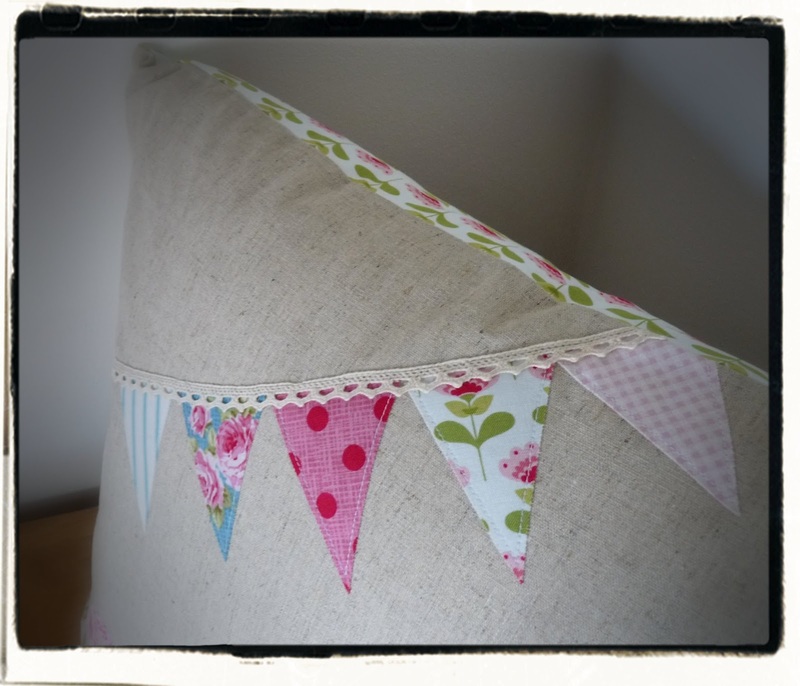 It uses my favourite natural cotton/linen base fabric and then incorporates lots of lovely Tilda floral, stripes and spotty fabrics for trims and applique, with a bit of ribbon thrown in to finish it all off. 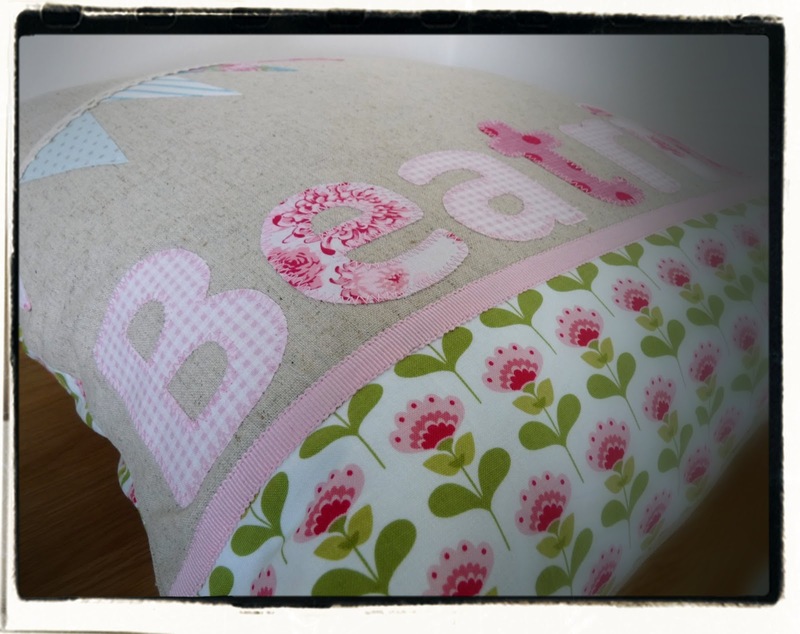 Having made a girls cushion, I thought I’d better redress the balance and design/make a style for boys…It’s quite different from the soft, gentle shades of the girls’ version….it is, indeed, a bit bright…..! 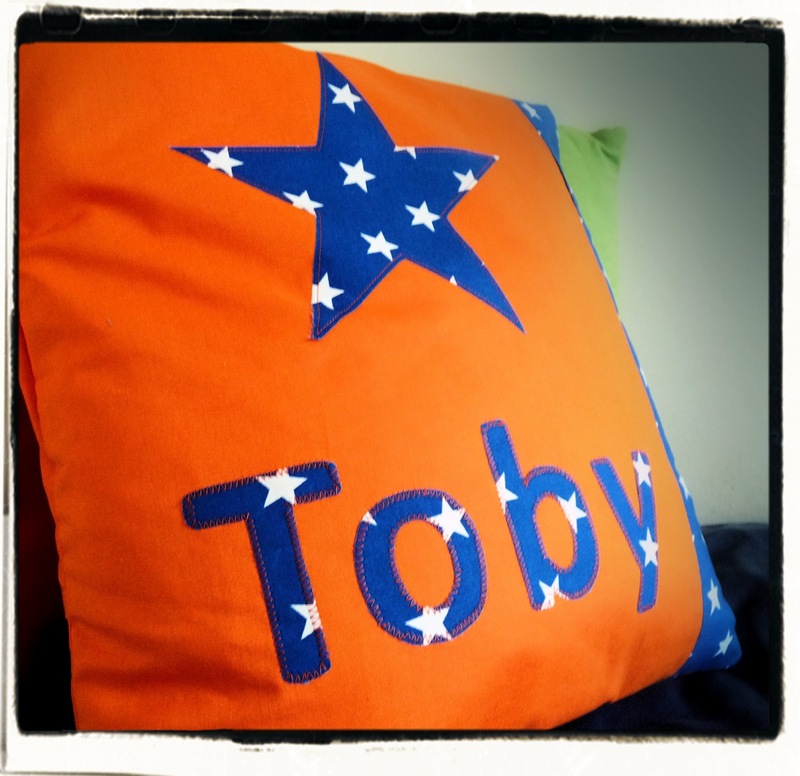 I do love a bit of orange for boys. It makes a refreshing change from blue, green and brown and is an alternative ‘bright’ to red, which always feels a bit ‘school-uniformy’ to me….Plus, it actually looks great as a ‘clashing’ colour. 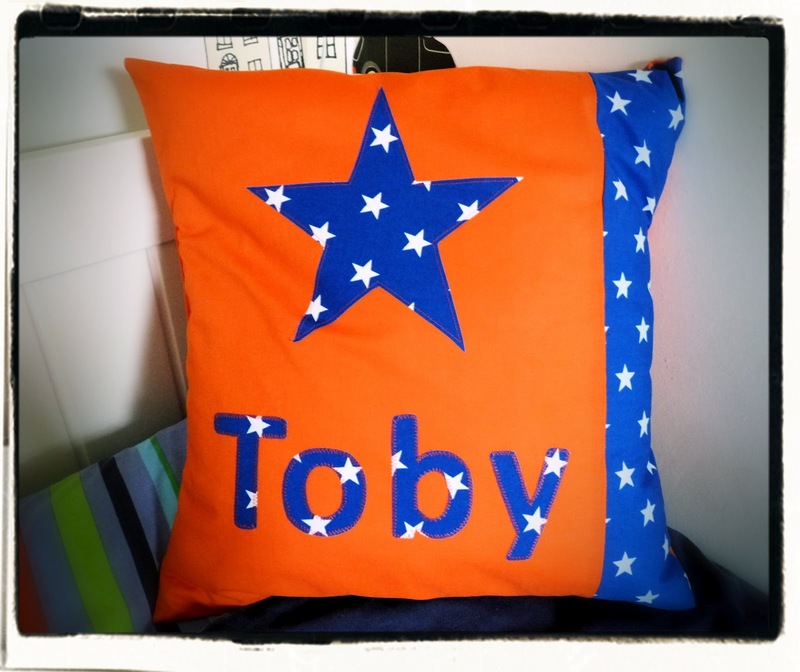 I had some orange linen-type fabric and a small piece of this blue star fabric which was a bit ‘busy’ just on it’s own…but with the orange, works much better I think. 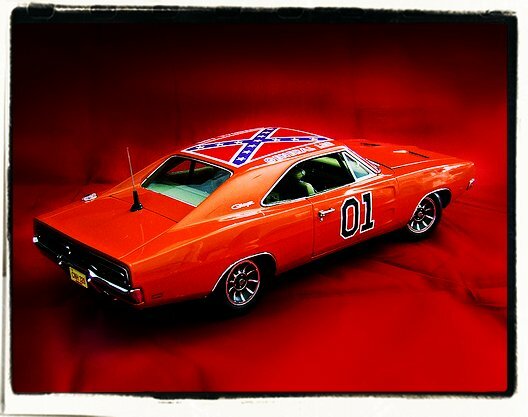 So this now brings me to that Dukes of Hazzard reference……whilst making this cushion, I had a nagging thought in the back of my head that it reminded me of something…struggling to place it all morning and then suddenly, of course…’The General Lee’, the car from that fantastic (maybe I’m being a bit nostalgic here thinking it was fantastic?!)) 1980s U.S show. See what I mean?…sort of?? 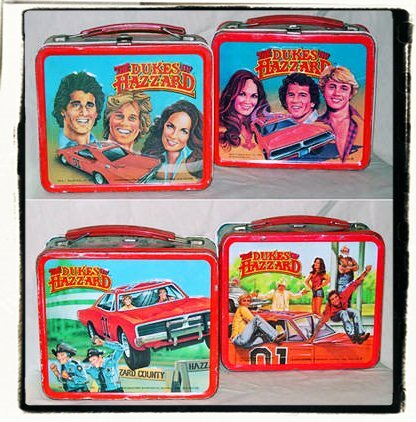 How brilliant!…original Dukes of Hazard lunchboxes. Sort of wished I’d had one of these for my school packed lunch in the early 1980s instead of that pink plastic ‘My Little Pony’ one!! I went to a lecture last week where the presenter said that in most houses now, there are more devices that will connect to the internet than cushions. Not in my house!